Mr. Caverly joined Stone Pigman in 1985 and is a member of the firm. He chairs the firm's Corporate and Securities Practice Groups and maintains an active business practice. Represented Quality Distribution, Inc. in its acquisition of 100% of the outstanding shares of stock of Boasso America Corporation, an intermodal service company providing tank container cleaning, heating, testing, maintenance, storage and transportation services along with associated equipment sales for the trucking, rail, and maritime shipping industries. Represented a leading New Jersey-based manufacturer and distributor of industrial rubber products and related companies located in Canada, Mexico, Brazil and China, in a sale of 100% of the equity of the companies to a strategic purchaser based in Europe. Represented Advanced Metering Data Systems, L.L.C., a technology company providing fixed-based, wireless automatic meter reading technology and services for electric, gas and water utilities, including formation of the company, venture capital financing, FCC license acquisition, AMR licensing and service agreements, and the sale of substantially all of its assets to Sensus Metering Systems, Inc. Represented Gerhardt Holding Company and its operating subsidiaries in a sale of substantially all of their assets to CISERV USA, Inc., a subsidiary of Wärtsilä Corporation. Gerhardt, with facilities in Texas, Louisiana, Delaware and California, was a leading provider of services and components for industrial engines and turbines, including fuel injection systems, industrial ignition systems, and control systems for various industries, including pipeline companies, refineries, chemical plants, and utilities. Represented U.S. subsidiary of Swiss multi-national chemicals company in its acquisition of 100% of the outstanding shares of stock of a Louisiana-based specialty chemicals company producing chemicals for the petroleum exploration and production industry, and in the purchase of related assets, including real estate and manufacturing facilities from a related entity. Represented the sellers of all of the voting stock of three related corporations operating a dock, terminal, and chemical storage facility on the Mississippi River. Represented the seller of substantially all of the assets of a Mississippi fixed base operator. The FBO's operations included providing aircraft hangar facilities, fuel and oil dispensing, aircraft supplies and other traditional FBO services. Represented privately-held regional HVAC distribution company in sale of business to manufacturer. Represented various banks and bank holding companies in bank merger transactions, including drafting and negotiation of plans of merger, proxy statements and related documentation in stock-for-stock and all-cash transactions. Represented the holder of a majority of the outstanding voting stock of publicly-traded oil & gas service company in privately negotiated sale of stock. Represented numerous health care providers in both acquisitions and sales of businesses, including hospitals, home health agencies, physician practice groups, and a regional emergency medical service company. Represented U.S. subsidiary of a Japanese multinational in its acquisition of substantially all the assets of a privately held Louisiana distribution company. Represented gas distribution company in its acquisition of 100% of the outstanding stock of a privately held gas distribution company. Mr. Caverly was Program Director of the Cambridge Institute seminar Buying and Selling Privately Held Companies, 1997-99. He is a member of the American and Louisiana State Bar Associations and the French-American Chamber of Commerce, and is fluent in French. Mr. Caverly is The Best Lawyers in America "Lawyer of the Year" in New Orleans for Venture Capital Law in 2016, Mergers and Acquisitions Law in 2015 and Corporate Law in 2014. 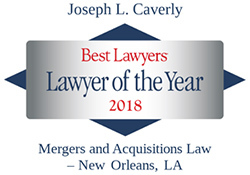 He has been named to Chambers U.S.A. America's Leading Lawyers for Business and Louisiana Super Lawyers. He has also been recognized as a Top Lawyer by New Orleans magazine.